You may embroider our patch-type designs directly on the garment, omitting the first thread, OR create easy to attach standalone patches, following the instruction described below. 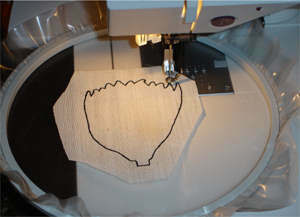 Read through this small tutorial to learn creating embroidered patches. 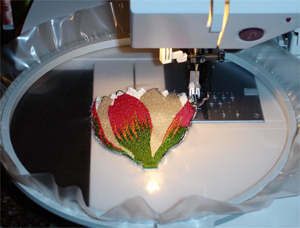 Making machine embroidered patches is more than easy. We've included photos and step-by-step explanations using actual example, to help you get started. 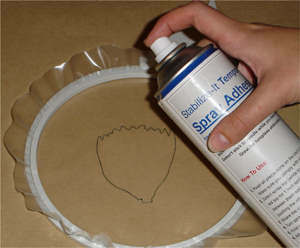 Temporary adhesive spray for machine embroidery & appliqué. Pay attention at photos below, to see how they look. The curve on handles is important, because it makes the scissors a lot more convenient for precise cutting. Lightweight, non-fraying and easy to cut fabric, that will serve as basis for your patches. You may use many different types of fabric for this purpose. Organza may be a good choice, for example. Print thread & fabric change list of specific design you're going to stitch. If you intend to use fabrics that may have tendency to shrink, wash it, applying the same conditions that you intend to use for it's laundering later on. 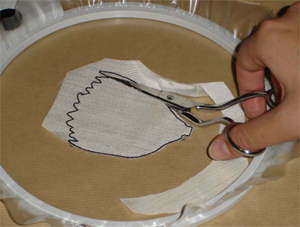 This will preshrink the fabric, and prevent lots of troubles with fabric puckering. Iron all fabrics you're going to use for your project. Avoid using very slippery fabrics, at least at the very beginning. Later you'll know to deal with them, too. Avoid using easily fraying fabrics. If you have no choice - eliminate fraying by applying "No Fray Spray" on it. Hooping water soluble backing (alone). 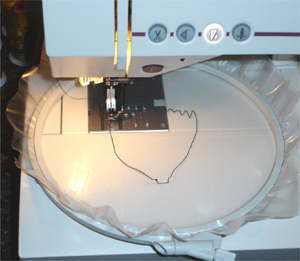 Marking the future patch contours, using embroidery machine and very first thread of patch type design. 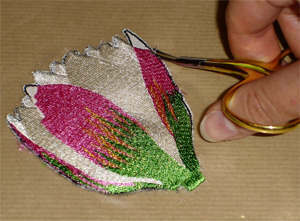 Applying temporary spray adhesive on hooped soluble backing, inside the embroidered outline. 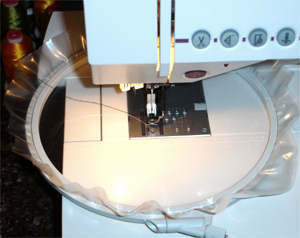 Positioning a piece of base fabric over the hooped WSB (water soluble backing), sewing it on (second design thread) and cutting the excess edges. Embroidering the rest of design, following thread change list. 1. 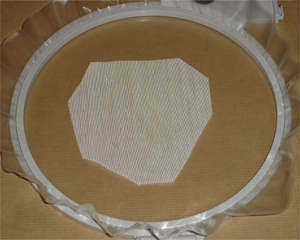 Hoop water-soluble backing (alone), and slide the hoop into embroidery machine. The backing mustn't pucker. If it puckers rehoop it again, until you achieve the desired result. Large hoops sometimes don't hold fabric/stabilizer well enough. If your hoop has such tendency, insert a piece of thick fabric between four opposite hoop sides, when hoping your stabilizer. Or, purchase a new hoop. Most machine manufacturers have recently noticed this problem, and started offering hoops with special metal spins. These little spins do wonders, and hold the fabric/stabilizer in place. So ask your dealer for such hoop. You will be glad you did. 2. Mark future patch contours, using embroidery machine and the very first thread of selected patch design. 3. 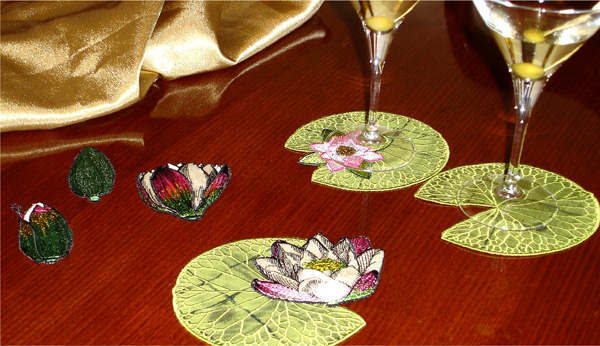 Apply temporary spray adhesive on soluble backing, inside the embroidered outline. 4. Position a piece of lightweight base fabric over the hooped WSB. Just stick it over the outlined area. Temporary spray adhesive that you've just applied will hold the fabric in place, and prevent it from puckering later on. Let the adhesive spray dry (2-3 minutes is enough). < p style="width: 600px;">Remove the hoop. 5. 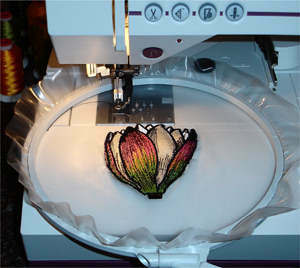 Slide in the hoop back into your machine, and embroider the rest of design, following thread change list. When you embroider everything but the outlines, remove the hoop again, and carefully cut all pulling threads and thread "tails", if there are.